The term “locavore” has been used to describe people as diverse as former hippies living off the land as well as foodies perusing farmers’ markets for organic produce. The notion of local food and its place in the United States’ economy is evolving, however. For a longer perspective on the local food movement, here are seven books–both classic and more recent–about the importance of nurturing native food sources for our own health and the health of our nation’s food supply. 1. 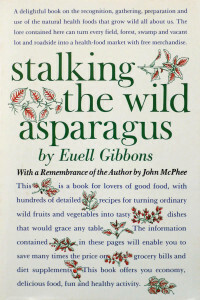 Stalking the Wild Asparagus (1962) by Euell Gibbons. What could be more local than walking along the fencerow in your backyard, picking a handful of wild plants for your salad? Euell Gibbons was one of the first authors to write about foraging for wild edibles. His book contains instructions for finding and identifying wild plants, then recipes for including them in a variety of dishes. Gibbons’ enthusiasm for and deep knowledge of his subject has made this book a classic for over fifty years. “The spicy teas and tasty delicacies I prepare from wild ingredients are the bread and wine in which I have communion and fellowship with nature, and with the Author of that nature,” he writes. 2. The Unsettling of America (1977) and What Are People For? Essays by Wendell Berry (1990) by Wendell Berry. 4. Animal, Vegetable, Miracle: A Year of Food Life (2007) by Barbara Kingsolver, Steven L. Hopp, and Camille Kingsolver. 5. Deep Economy: The Wealth of Communities and the Durable Future (2007) by Bill McKibben. 7. Reclaiming Our Food: How the Grassroots Food Movement is Changing the Way We Eat (2011) by Tanya Denckla Cobb.